Achieving proper positioning during procedures and maintaining proper posture during life activities is often critical to alleviating pain. Current Therapeutics at e-current.com provides the tools your practice and patients need to achieve these goals. From rests and rolls to pillows and cushions, our selection of support items will assist patients with a variety of clinical conditions. Whether cylindrical or contoured, our cervical pillows can help relieve headaches and neck pain. 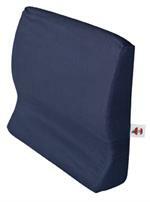 The Tri-Core pillow supports the head and cervical spine with a unique therapeutic design. Our quality lumbar rolls can be used at your desk, in the car and at home to ensure proper posture throughout the day. Leg spacers and back rests will also provide support to your patients between therapy sessions. While at therapy or at home, let our support products help keep your patients in perfect position. Purchase Tri-Core pillows, cervical pillows, foam rollers and lumbar rolls from e-current.com today.